Daughter of art lovers and intellectuals, from an early age Chía showed artistic skills and by the age of 14 she was already experimenting with various painting techniques ranging from oils and pastels to classical porcelain painting techniques. Later she studied Graphic Design and started an Advertising Business career. The creative surge of Chía has been wide and unstoppable. 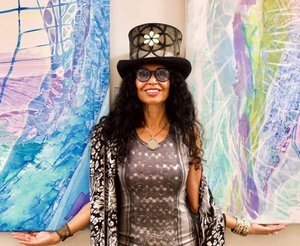 She has produced extensive art works among large canvases, drawings, fashion designs, murals, photographs, mixed media and more recently conceptual art installations that involve the community. In her words, the process of painting is for her a catalyst for self-consciousness and self-transformation, an exploratory journey towards an intimate landscape in which to transform internal chaos into harmony: the alchemy of oneself.